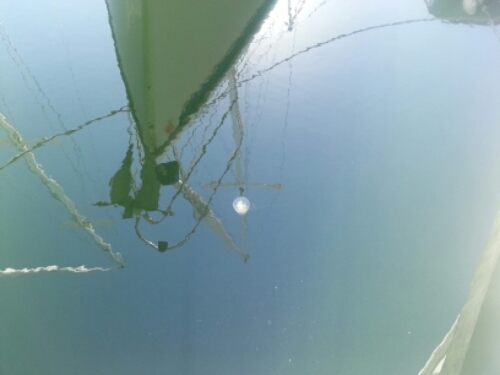 In the Chesapeake where we started out with Tango, we were plagued (mostly in the spring) with sea nettle jellyfish. As the bay has gotten warmer and more polluted, the sea nettle blooms have gotten so bad that a new industry developed, that of expensive “nettle nets.” These pop-out inflatable circular nets trail behind your boat or from shore, so you can swim safely and not get stung. Robin used to cruise craigslist looking for a good used nettle net, as they can be quite pricey. She never did find one, but after we left the Chesapeake, we didn’t ever see too many jellyfish, so she let that one go. We had no idea that jellyfish were such a problem in the Puget Sound as well. 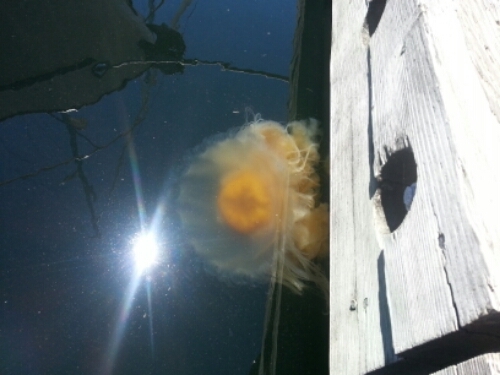 Here in the Elliott Bay marina, we see so many jellyfish every time we walk the dock to shore. Finally, we took some time to look up what they were, and to find out if their stingers are painful (a very important girl question). We found out that most are fried egg (or egg yolk) jellyfish. Guess these guys are wimpy in the world of stinging tentacles and many small creatures will ride on their bells and steal food. The bad boys around here are the lion’s mane jellyfish. They look very similar, but apparently have more pink in them. Whoever we have floating around us, fried egg or lion’s mane, it’s cured the girls of wanting to even dip a toe in the water. Not sure they will let Max get more than ankle deep either…next girl question…can they sting through fur? I love google and wikipedia for these rabbit trail question sessions!